I finally finished the final 2 starter units that I purchased in June. These are both 4 point war bands, and are what is recommended to learn the game. First up is a 8 figure Viking Warrior unit. I used axes for the weapons in 7 out of the 8 weapons, but I found for some of them that the pose looked a little odd and maybe I should have used javelins. I will have to fix the shield to the left not sure how it got smeared with red. The last unit I completed was Skraeling Warriors. I call this the red band! I just could not get into the warpaint. 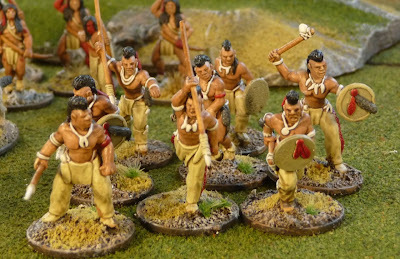 So here is my Skraeling 4 point war band (Chieftain, 3 warrior units and 1 levy unit). And finally all 8 points, time to play a game I suppose. So where am I going to go with SAGA, well hopefully some games in the next couple of weeks. 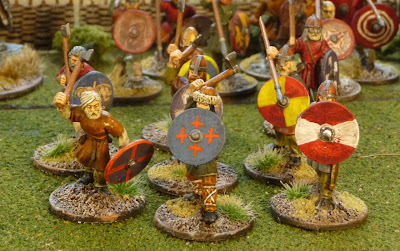 I am interested in painting up either a Norman or Breton War Band as well, I will also add to the Viking War Band with a unit of levy and another unit of Hearthguard. I believe at the moment that I am unlikely to add any more Skraelings. Recently there has been much on the go with Dark Ages wargaming with the release of the 2 Dux's. 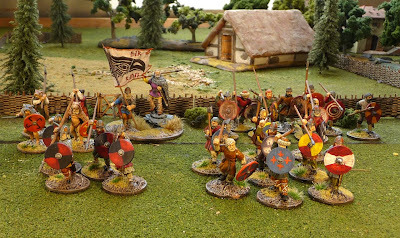 Both games appear to have got excellent reviews and I believe I can morph the Viking figures into suitable Saxons to take on the Romano-Britians in Dux Britanniarum from Too Fat Lardies. I recieved these rules a couple of weeks ago and the campaign system looks really neat. Have to slow down though as I have just made a major Napoleonic purchase about which I am quite excited. More to come. Nice looking warbands and I really like the new blog header pic! Great work!! Love the Skraelings, I want some of them....must resist, must resist!!!! Nice figures! Even with you pointing it out I still can't see the smudged shield! Awww John - no warpaint for the Skraelings! Seriously - they look great. 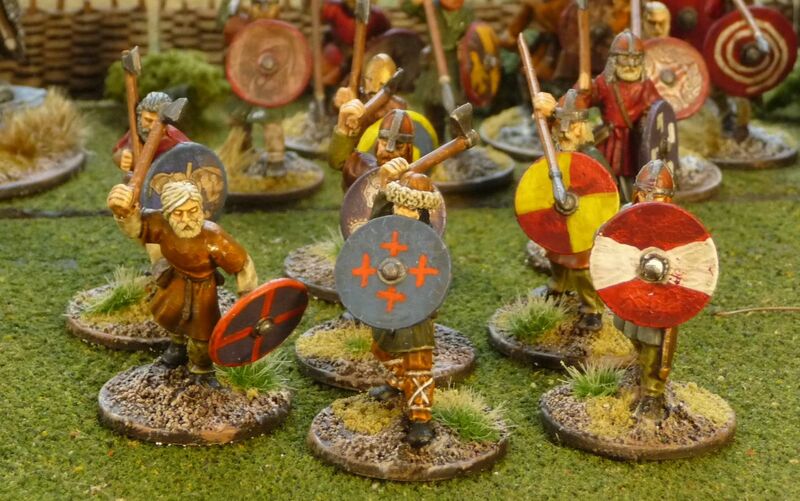 Be an interesting fight - few missile figures for the Vikings and the Skraelings would probably want to avoid hand-to-hand with crazed Vikings! Should balance out nicely. October the 6th, John, the beginning of your Saga ? Looks really great, can't wait. And I purchased my copy of the rules. So be prepared.